So the Christmas party was a success, as was the buche de noel. I put this picture up on Facebook, but you know…. Of course, they’re usually chocolate, but this one is a “Birch de Noel.” I thought everything turned out great except for the meringue mushrooms…because the tip on my pastry bag wasn’t big enough. But the whole thing was gone by 9:00 and it tasted amazing. I think I used about a dozen eggs making the whole thing (most of them were just the whites). 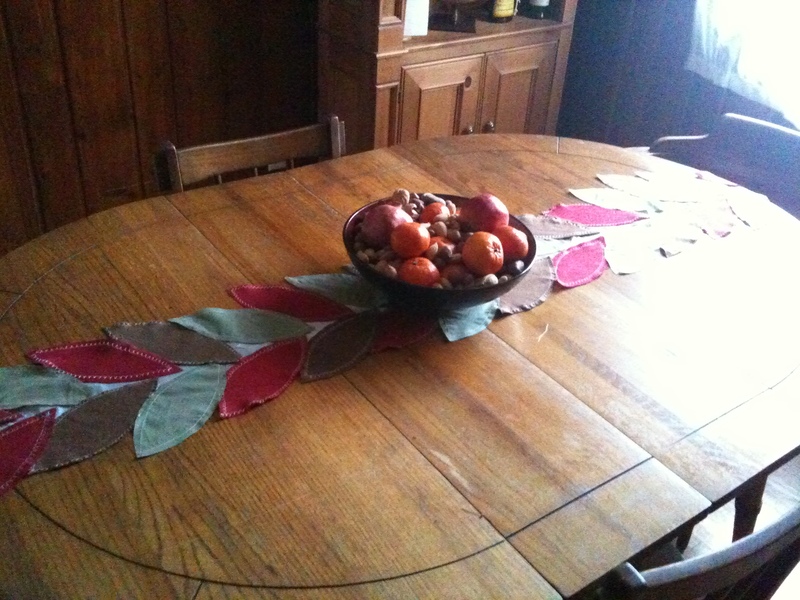 Here are a couple of pictures of the tablescape. It turned out well…though the lighting wasn’t so great and neither is my iPhone camera, so they’re kind of grainy and dark. 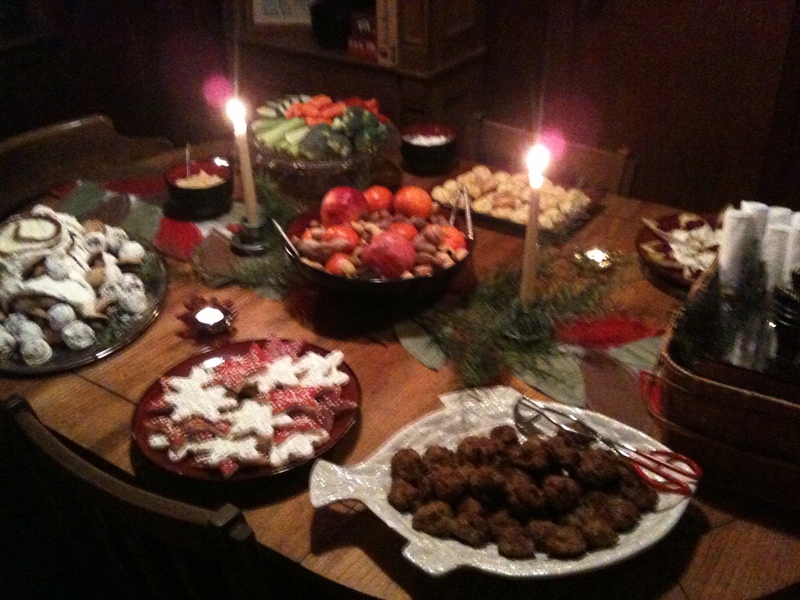 Left to right – the yule log, sugar cookies (that I made, of course), and sausage balls (which Matt made). 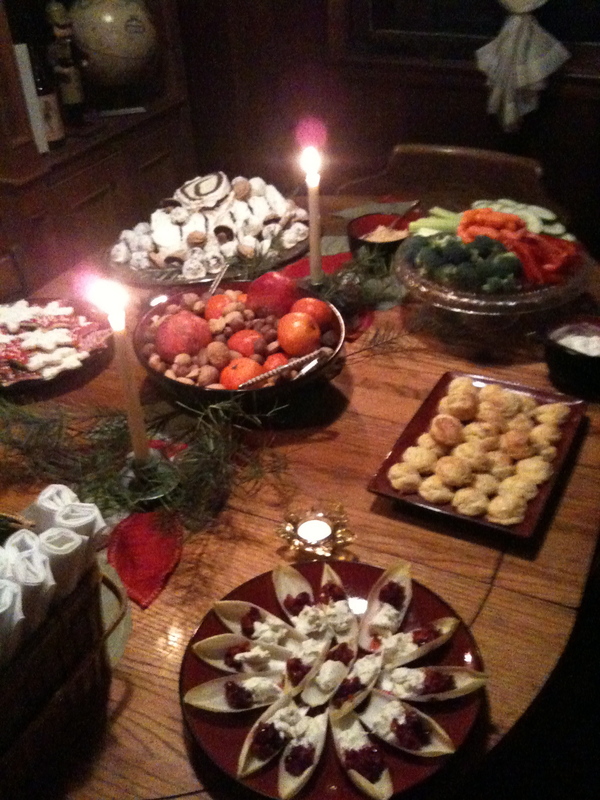 Starting at the top of this picture, there’s a veggie platter, then gougeres (with goat cheese and rosemary), and then endive spears with goat cheese and cranberry relish. Now, two days later, we haven’t cleaned anything up. Yesterday was spent in recovery (I may have had a little too much rum in my apple cider), and now I am faced with a house full of cups, plates and forks, gift wrap from the dirty santa game, and lots of empty bottles. Stupid party cleanup. I think I’ll just straighten up today, and save the actual dish-washing for tomorrow. I really wish we had a dishwasher…. So it was 61 degrees in the house when I got home from work (going to have to start leaving the heat on during the day I guess), and it’s taken me FOREVER to warm up. Granted, an hour later it’s still 66 degrees, but I’m quite warm now after putting on a thick pull-over sweater underneath my fleece robe. I’m about to take off the sweater actually. This is why I can’t ever wear these things out – because in about 5 minutes, I overheat but can’t take it off since I anticipated being hot and only wore a cami underneath. I usually forget deodorant, too. Anyway. So I’m throwing a Christmas party on Saturday, and am planning on going all out with the hors d’oeurves. 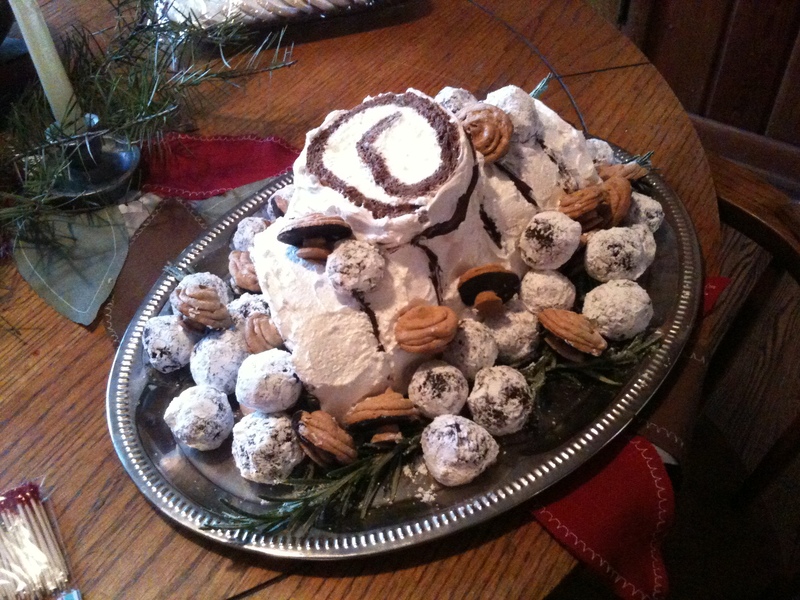 Plus I’m going to make a “Birch de Noel” – Martha’s white chocolate take on the buche de noel. The picture was so cool-looking that I decided I’d rather make it than babka. I might still make babka. We’ll see. Though not as pretty as the picture (if anyone cares, this is also one of Martha’s inspirations), it actually turned out a lot better than I anticipated. Anyway, this afternoon – on the Party Schedule – I’m supposed to deep clean the house. At this point in the afternoon, I’m kind of seeing “deep clean” as meaning that I’ll clean the bathroom, do a couple of loads of laundry, wash the dishes, and probably sweep. That’s more like “normal clean,” but hey, I generally keep things fairly clean anyway… (I’m much better at housekeeping now). So I’m watching/listening to A Christmas Carol since Matt hates Christmas movies. We spent way too much time the other day talking about whether George Bailey is a “common, everyday yokel” or not. (Really, the debate was about whether that movie is a parable or not…and whether the moral — no man who has friends is a failure or whatever it is — was actually true.) I think my argument should be obvious, though he did make a pretty good point at times. Good, if jaded. So you know.